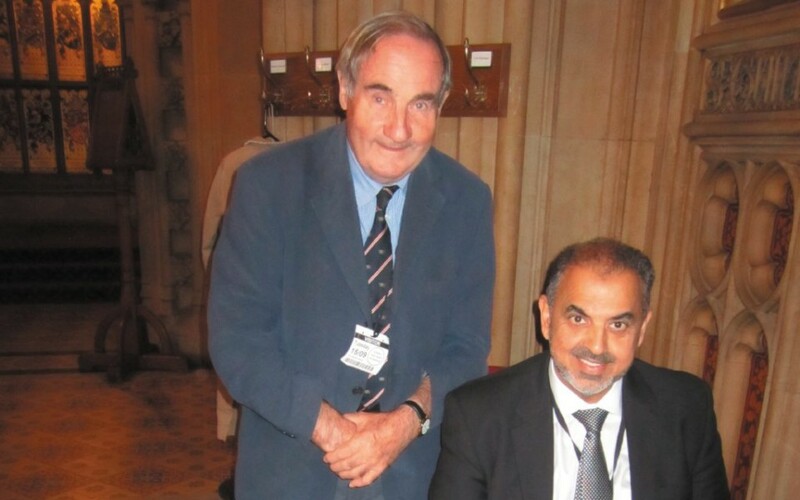 A FORMER Olympic coach from Fladbury has visited the House of Lords to push his Paddle for Life campaign. David Train made the trip to London on Tuesday, September 13, where he met and spoke to Lord Ahmed about his paddle project and got the Labour peer to sign the Mirpur Paddle for Life – in the combat against climate change. Lord Ahmed promised to inspire the Prime Minister of Pakistan, Muhammad Nawaz Sharif, to sign the paddle, which Mr Train hopes will lead to President Xi of China joining the campaign too. The paddle will be used as a perpetual trophy for the Mirpur-Main Regatta in Mirpur – where Lord Ahmed was born – following the model that was developed in Fladbury. “In July I was approached by Mushtaq Hussain from Burton upon Trent who is setting up a water sports activity centre in Mirpur,” said Mr Train. “He had seen the bell boat at a water sports centre in Leicestershire, thought it was a wonderful invention and wanted one to copy for Pakistan. “He did not know about the ideas attached to it, but when he did he became highly enthusiastic and I saw a brilliant opportunity to further the Worcestershire cause by giving Mushtaq a bell boat and all the ideas that come with it,” he added. The boats will arrive in Pakistan in early October.